Parents and guardians, school safety is a top priority in the KPBSD. It’s important for you to know what to do before, during, and after a school emergency, weather related delay start, or school closure. 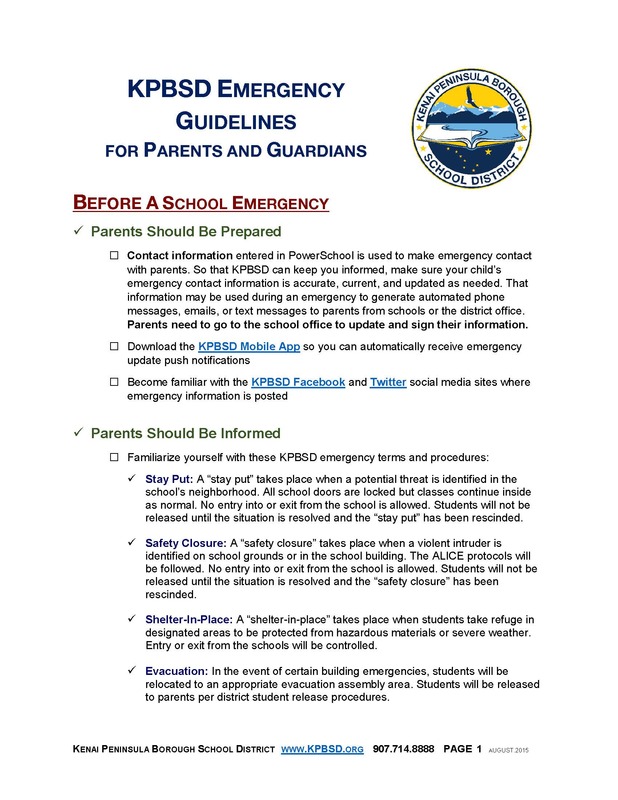 Kindly read KPBSD Emergency Guidelines for Parents and Guardians. KPBSD regularly practices safety drills in schools, and includes law enforcement in our ALICE trainings for school emergencies. School delays and closures protocol. Contact information entered in PowerSchool is used to make emergency contact with parents. So that KPBSD can keep you informed, make sure your child’s emergency contact information is accurate, current, and updated as needed. That information may be used during an emergency to generate automated phone messages, emails, or text messages to parents from schools or the district office. Parents need to go to the school office to update and sign their information. Stay Put: A “stay put” takes place when a potential threat is identified in the school’s neighborhood. All school doors are locked but classes continue inside as normal. No entry into or exit from the school is allowed. Students will not be released until the situation is resolved and the “stay put” has been rescinded. Safety Closure: A “safety closure” takes place when a violent intruder is identified on school grounds or in the school building. The ALICE protocols will be followed. No entry into or exit from the school is allowed. Students will not be released until the situation is resolved and the “safety closure” has been rescinded. Shelter-In-Place: A “shelter-in-place” takes place when students take refuge in designated areas to be protected from hazardous materials or severe weather. Entry or exit from the schools will be controlled. Evacuation: In the event of certain building emergencies, students will be relocated to an appropriate evacuation assembly area. Students will be released to parents per district student release procedures. Should trust that during an emergency the school and district is first doing what is needed to protect students, and then communicating to parents as quickly as possible when we have full and accurate information. Should trust that staff and students are prepared for emergency situations. Schools participate in emergency drills throughout the year, and staff and emergency responders know the best procedures for keeping students safe. Phone lines, staff, and local roads are needed for emergency response efforts. The sound or vibration from cell phones and phone conversations could put students in danger. Also, students need to be paying attention to the instructions from trained staff. Conflicting instructions from parents may put a child’s safety at risk. HOW WILL I BE REUNITED WITH MY CHILD? Parents and guardians will be directed by school or public safety officials to their child’s specific location. This information will be distributed via the previously discussed emergency modes of communication. 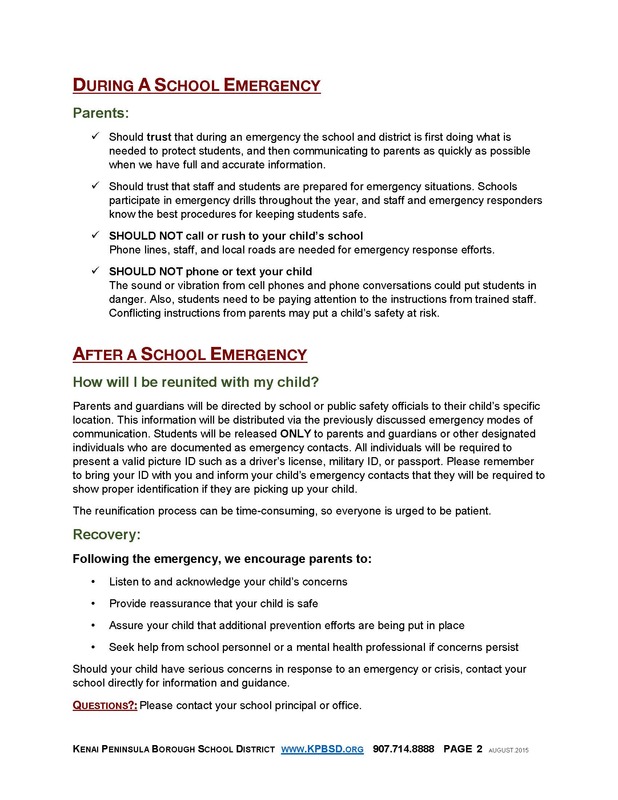 Students will be released ONLY to parents and guardians or other designated individuals who are documented as emergency contacts. All individuals will be required to present a valid picture ID such as a driver’s license, military ID, or passport. Please remember to bring your ID with you and inform your child’s emergency contacts that they will be required to show proper identification if they are picking up your child. The reunification process can be time-consuming, so everyone is urged to be patient. Should your child have serious concerns in response to an emergency or crisis, contact your school directly for information and guidance. Questions? : Please contact your school principal or office. This entry was posted on February 21, 2018 at 4:11 pm. You can follow any responses to this entry through the RSS 2.0 feed. You can leave a response, or trackback from your own site.